Stress has become part and parcel of our fast-paced life, and all of us experience it in one form or the other. For some of us speaking in public might cause unforeseen stress while for others getting stuck in traffic on a daily basis might be stressful. Stress is always there in one form or the other, let us understand one thing very clearly, and that is stress is not always bad, the kind of stress that makes you put in your 100% to get the desired result is said to be positive( but the instances are few) The real problem with negative stress is when it begins to interfere with your life and continues for an extended period, then it becomes chronic, and chronic stress affects all systems of our body in a negative manner and it is detrimental for our well-being. How Stress Affects Different Parts and Systems? Respiratory system- when one is stresses one breathes harder which is no problem for a normal fit person, but if you have asthma or emphysema ( lung disease) then it becomes difficult to get oxygen to breathe. In some cases acute stress can lead to panic attacks, death of a loved one can also cause an asthma attack. Cardiovascular system-this is not news that the heart and vessels work in tandem to ensure that all parts receive nourishment and oxygen, what is news though is the fact that our response to stress is also coordinated the activity of these two. In case stress becomes Chronic then it means the effect is adverse on the cardiovascular system and also give rise to hypertension, heart attack or even a stroke. Musculoskeletal system- the first sign of stress is tensed muscles which is the body’s natural response to stress, but if it persists then chronic stress gives rise to headaches, migraines and in extreme cases muscle atrophy, muscle tension gives rise to stress-related musculoskeletal conditions. Gastrointestinal –stomach-esophagus-bowel– are all affected by chronic stress causing symptoms like diarrhoea, nausea, vomiting, constipation, bloating and heartburn. With stress becoming an integral part of our lives and the effects of stress touching every aspect of our life from behaviour to body functions and health problems like diabetes, blood pressure, infertility it is essential that we look for ways to combat it naturally. 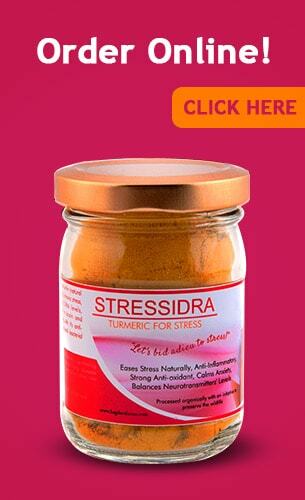 The best and the most natural way to fight all kinds of stress acute/chronic is to make Stessidra from Bagdara farms a part of your life. Stressidra is 100% organic and natural and has a high curcumin content thus loaded with the pharmacological and therapeutic properties of this fantastic phytochemical. Curcumin has the power to reverse the damage caused by stress. The curcumin in Stressidra helps in regulating the activity of neurotransmitters thus balancing the levels and helping keep stress levels at bay. Curcumin has the unique action of regulating the gut-brain axis which helps in checking gastric and digestion related problems brought on by stress. Curcumin also has potent action in inhibiting the production of stress causing hormones. Curcumin controls stress at the cellular levels as stress tends to inhibit the natural anti-oxidant system and also promotes oxidative damage and this is when the powerful anti-oxidant action of curcumin kicks in and helps reverse. Curcumin helps balance the cortisol levels and also regulates the adrenal gland function which in turns helps regulate human behaviour on account of stress. The neuroprotective action of Curcumin helps protect the brain from the effects of chronic stress. The high curcumin content helps alleviate DHA levels not only in the brain but also in the liver tissues and this, in turn, leads to stronger cognitive function and reduces the anxiety attacks. The powerful anti-oxidant action of Curcumin reduces oxidative damage and the anxiolytic properties making it an efficient anti-stress agent. The behaviour-modulating mechanisms are activated by Curcumin in the central nervous system which helps manipulate the cell signals thereby improving control and preventing anxiety attacks. 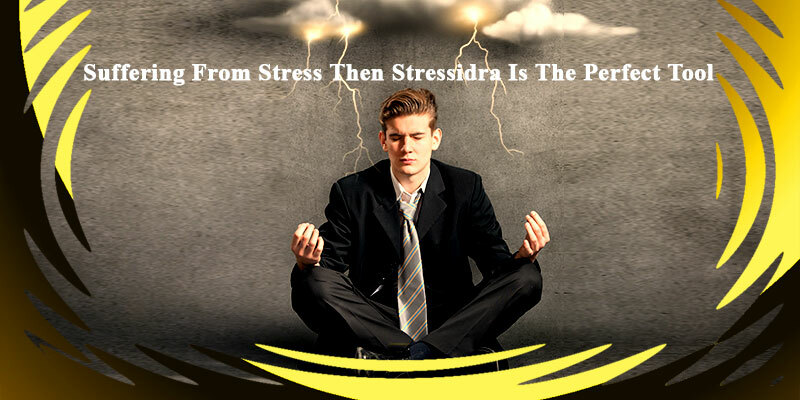 If you have stress( means you are alive), then Stressidra is the perfect tool to beat it at its own game.